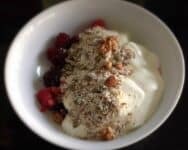 Grain free granola can sometimes be time consuming, or in the summer, you may not want the oven on, so here is a grain free raw muesli that requires no baking. When you start reading cereal packaging and discover most contain 70-80% carbs, you soon want to find something else. 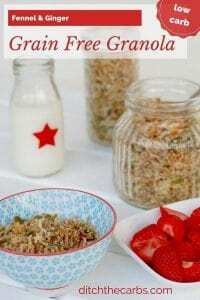 I make a HUGE jar of my own grain free raw muesli every couple of weeks. It is packed full of seeds, nuts and coconut threads. Just add whatever you have in your pantry, but here is what I generally use. My children like sprinkling raw muesli onto berries for an after dinner treat with come coconut milk. Manufactured cereal is just so high in carbs, you won’t want to touch it. Not only that, it is then fortified so it can make claims of being high in iron, folate etc. 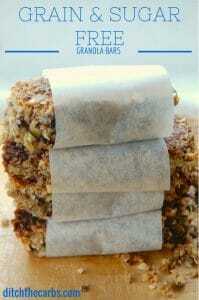 Read my post on Grain Free Granola. If you understand what is wrong with cereal production, you will understand what is wrong with modern food production. There are some great video clips to watch, or take a look at my YouTube Channel. 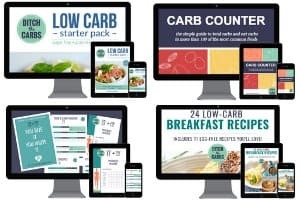 If you are new here, this page may help you to understand how low carb works. Mix all the seeds, nuts and coconut together. Place in an air tight jar. Serve with yogurt, berries, coconut cream or milk. Can be kept in a cool pantry for up to 3 months. Take a look at my Low Carb Starter Kit. It shows you exactly what I keep in my pantry. Serve with some defrosted mixed berries and natural unsweetened yoghurt. It is jam packed with nutrients, vitamins, minerals, etc etc. I also add coconut cream as I can’t seem to find a low carb AND high fat natural yoghurt. I made this yesterday, with a slight variation – I toasted each in the oven for 5-10 minutes first. Ate mine with almond milk today and OMG!!! For the first time EVER, I was full for 3.5 hours after breakfast!!! My brother, a fitness coach, loved it too! This is fabulous! Thi is such an old recipe, you might want to try my updated ones here. Generally speaking, what is a serving size? I tend to have 1/4 cup over some full fat unsweetened yoghurt which I find is ample (my children always sneak more than this). I make a variation of your LC granola and have it with lightly sweetened (SF flavored syrup) ricotta. Sometimes, I will add blueberries or strawberries on top. Filling and delish as breakfast alone or top over oopsies for a super good fat and filling breakfast. I will try this one as well and see if I can get my husband to eat this over his cereals. That’s brilliant. It is so hard to find full fat yoghurt here so I add coconut cream to mine. We haven’t had cereal in our house for almost two years and eat eggs for breakfast every day. My kids loved helping me make this yesterday and gobbled it up this morning. It is nice to have a low carb breakfast option that doesn’t require cooking anything! 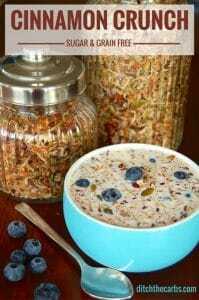 Seriously, as easy as cereal but without the junk!